This nozzle set fits Evolution CRplus, Evolution ALplus & Infinity CRplus airbrush ranges.. 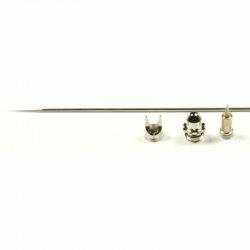 This Set Includes: .20mm nozzle with solvent-resistant seal, .20mm needle, 0.20mm aircap, and the infinity style (forked) needle cap. This Set Includes: .15mm nozzle with solvent-resistant seal, .15mm needle, 0.15mm aircap, and the infinity style (forked) needle cap.